From Winston Groom, the best-selling author of Forrest Gump; Shiloh, 1862; and Vicksburg, 1863, comes the fascinating story of three extraordinary heroes who defined aviation during the great age of flight. Targeted to fans of Unbroken, The Greatest Generation, and Flyboys, these cleverly interwoven tales of heart-stopping adventures take us from the feats of World War I through the heroism of World War II and beyond, including daring military raids and survival at sea. With the world in peril in World War II, each man set aside great success and comfort to return to the skies for his most daring mission yet. 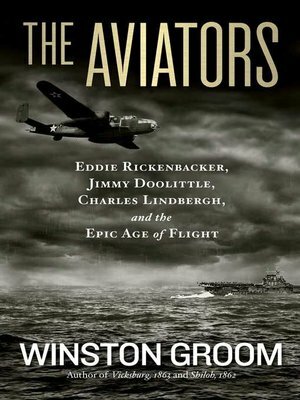 Doolittle, a brilliant aviation innovator, would lead the daring Tokyo Raid to retaliate for Pearl Harbor; Lindbergh, hero of the first solo flight across the Atlantic, would fly combat missions in the South Pacific; and Rickenbacker, World War I flying ace, would bravely hold his crew together while facing near starvation and circling sharks after his plane went down in a remote part of the Pacific. Groom's rich narrative tells their intertwined stories—from broken homes to Medals of Honor, barnstorming to the greatest raid of World War II, front-page triumph to anguished tragedy, and near death to ultimate survival—as all took to the sky, time and again, to become exemplars of the spirit of the "greatest generation."